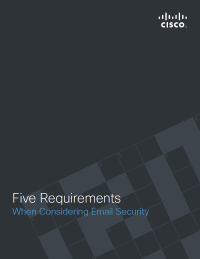 With the growing threat of hacker attacks, securing all end-points including email should be a top priority for all businesses. Cisco Email Security uses advanced threat intelligence and a multilayered approach to protect business-sensitive data and combat the most advanced malware attacks. Click here to download the report.